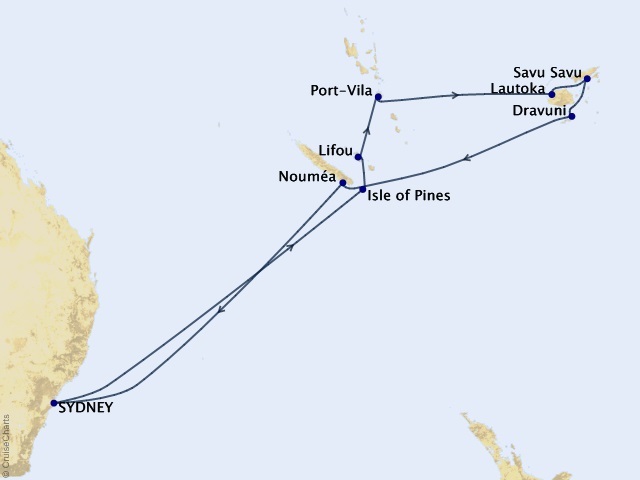 Departing from Sydney on February 18, 2020, prices starting at $6,237. 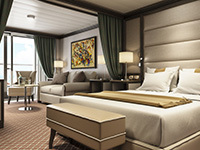 Silversea's newest flagship, Silver Muse is without question an inspirational work of art. The best place between sea and sky, eight dining venues, spacious outdoor areas and up-to-the-minute technology makes her simply divine. 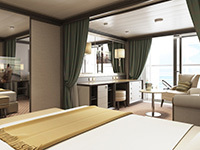 Accommodating only 596 privileged guests, Silver Muse redefines ultra-luxury ocean travel - enhancing the small-ship intimacy and spacious all-suite accommodations that are the hallmarks of the Silversea experience. 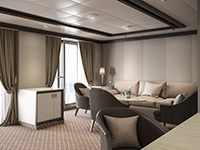 The addition of Silver Muse expands Silversea's fleet to nine ships, and once again significantly raises the bar in the ultra-luxury cruise market with a wealth of enhancements to the onboard experience, while satisfying the uncompromising requirements for comfort, service, and quality of the world's most discerning travellers. 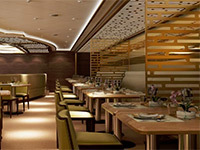 Pivotal to the Silver Muse dining experience, this elegant bar and grill incorporates the best that the sea has to offer. 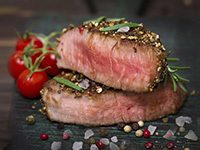 Created to temper your taste buds, designer dishes such as royal crab, blue lobster, and Verbena-infused red snapper in a sea salt crust are showcased alongside the best steaks offshore. An iconic hallmark of Silversea dining, La Terrazza offers authentic recipes and the freshest ingredients from their distinctive Italian heritage. This is where antipasti, primi and secondi come together with passion and flair in a flavourful expression from corporate chef Alberto Colombo’s imagination. La Terrazza aboard Silver Muse offers innovative interactive food stations: an olive oil cellar, a mozzarella bar, a seafood station and, of course, a salumeria. The à la carte menu has also been extended to include the popular Sapori di Casa, traditional family-style Italian daily specials. The five elements of Japanese nutritional cuisine make up Kaiseki’s menus. Dinner features a contemporary Japanese Tepan cuisine, presented through the interactive preparation “La Table du Chef,” where all ingredients are prepared directly in front of the guests. 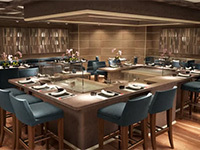 Daytime menus offer a varied and balanced menu of sushi, sashimi, and other raw Asian inspired dishes. Reservations required in addition to a small per guest dining fee. 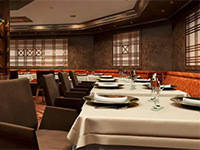 One of the healthiest cuisines to exist, Hot Rocks features lava stone cooking at its finest. Sourced from volcanic rock and placed in an oven to reach an optimum temperature of 400°C, Hot Rocks invites guests to cook their food directly at their table. Place your meat, fish or vegetables on top of the grill stone, or inside the soup bowl, and then simply cook to your very own taste. Every bite is cooked to perfection, time after time. With the stone cooking available in the evenings only, Hot Rocks becomes a daytime rotisserie and gourmet salad and burger bar, offering build-your-own burgers from the best selections of meat. A casual open-air option for guests, Spaccanapoli is an Italian Pizzeria located pool side that is open from morning to 11 p.m.
Silver Muse’s Relais & Chateaux restaurant, La Dame offers a “dirty French” version of authentic dishes and the best specialties of that cuisine. Reservations required in addition to a small per guest dining fee. Small plate tapas-style international dishes paired with jazz and blues music. Reservations required. Guests are taken on a culinary journey of discovery of Asian fragrances and seasonings at Indochine. 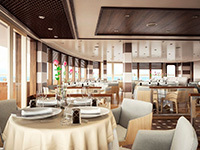 The restaurant also features the “Assaggi” bar for fast dining options from all dining venues on Silver Muse. It also offers an Enoteca counter for ultra-modern wine preservation. 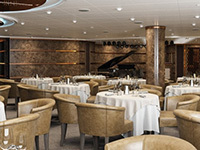 With complimentary cocktails and engaging conversation, live music and a dance floor, the Main Bar aboard this luxury cruise ship welcomes guests to mix and mingle. 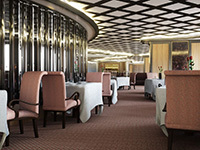 Specially designed to provide an uninterrupted view of the day's destination from the comfort of the ship's interior, the Panorama Lounge is an ideal place to unwind, enjoy afternoon tea, listen to the pianist and watch the setting sun. At night you can enjoy dancing to a range of musical styles for every taste, from standards to the latest club mixes. Every seat in this multi-tiered venue enjoys a clear view to the stage. 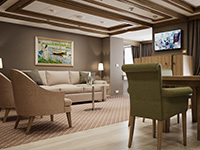 Throughout your cruise applaud a broad spectrum of entertainment , or partake in port talks, enrichment lectures and a variety of special events. A full range of salon services - including hairstyling, manicures and pedicures - are available on board for both men and women. 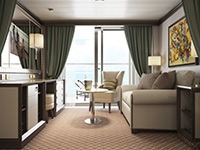 Featuring designer collections and duty-free shopping, the Boutiques on board this luxury cruise ship offer a selection of jewelry, fashions, perfumes and Silversea logo items. Toiletries and convenience items are also available for purchase. 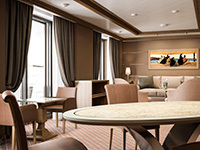 The Card Room on board is where bridge games and tournaments take place most days. On days at sea, newcomers to the game can learn how to play. 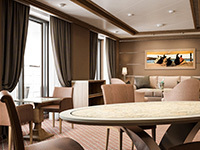 Should you require a conference or meeting space, Silversea is pleased to offer a tailor-made experience. 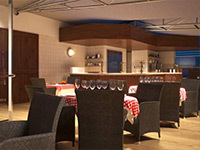 Audio-visual equipment is available and complimentary. The Library on board has an extensive selection of hardcover books, magazines, reference materials and newspapers, as well as audio listening stations. Movies are also available and can be viewed on your in-suite entertainment center. The Fitness Center is equipped with free weights, weight machines, state-of-the-art treadmills, elliptical trainers and recumbent and upright bicycles. Classes in aerobics, yoga, Pilates and circuit training are led by the onboard fitness trainer and are always complimentary. Relax your body and mind in this soothing sanctuary. Indulge in a wide range of invigorating therapies including facials, body wraps, and massages. Men's and Women's saunas and steam rooms are perfect for relaxing before your spa treatment or after your workout. Teak chaise lounges arranged in the sun or shade, bubbling whirlpools, and an attentive staff at the ready with an oversized towel as you emerge from the pool. It's the luxury cruise of your dreams.